This is the paperback UK edition of Tony Hillerman's novel Skinwalkers. It was published by Penguin Books, London, England, in 1993. The cover is by Instinct. The front and back covers are black, with a vertical line of red triangles along the spine. The front cover features a petroglyph-style drawing of the curved silhouette of a leaping cat, in red with a blue outline, over four upward-pointing, crooked arrows in yellow. The cover text includes the author name in white, praise for the author and the novel title in red, and "A Joe Leaphorn, Jim Chee mystery" in white, with the Penguin logo. The back cover displays a synopsis and praise for the novel printed in white, other titles by Tony Hillerman printed in red, the publisher's name, book price, and bar code. 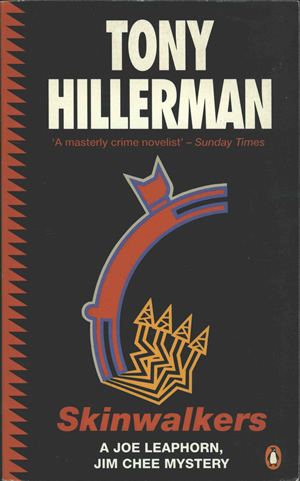 On the spine, printed horizontally, is "Tony Hillerman" printed in white with the name of the novel in red, a detail of the red leaping cat figure from the front cover, the ISBN number in white, and the Penguin logo. The inside front and back covers are blank.